Apartment blocks, condominiums, offices, shops, medical centres or professional studios in general… there are many situations in which it may be convenient to open a door remotely without needing to reach it physically every time, just as one does regularly with gates and doors when they are opened by pressing the button on the intercom. But on the doors of buildings, offices, studios and shops one cannot install the electric locks which are commonly used on doors and gates, either because there is not enough space, for example on French doors, or because a lock installed on the outside of the door is not attractive. Then what can one do? The solution is an electric strike. This is an extremely small product which allows a common mechanical lock, even one already installed, to be electrified, and therefore controlled remotely, without modifying it. The only action required, in addition, obviously, to the electrical connection, is the replacement of the striking plate on the door jamb, with one which houses the electrified part. In this way, the opening of the lock can be controlled by a pushbutton located in the most convenient position. 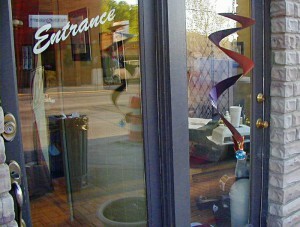 A classic example is that of a shop where you want to open the door to the customer when the bell is rung, and it is convenient to do so directly from the counter. A common use is also on internal access doors to buildings and commercial premises, where use of an electric lock is not possible for technical or aesthetic reasons. Electric strikers can also be used in situations where an external electric lock would ruin the appearance (photo by flickr/massimo ankor ). Another possible application is that of a professional office or studio where you want users or customers to enter only when there is not another person already present, but without getting up from your desk every time. If the office or studio is in a shared space , for example, a sharedmedical centre, having the ability to control the opening and closing of the door is even more important. Another typical case is that of business areas where it is necessary to control access, such as managerial offices or data processing centres . How does one install an electric strike? Installing an electric strike is simple, the lock is not touched. With respect to a common mechanical lock inserted in the door, one only replaces the striking plate on the door jamb . It is generally possible to use reversible strikers. They are convenient because they can be adapted to both right and left-hand doors, for pulling or pushing, simply by installing them in one direction or the another. In this case, straight type striking plates are used (so-called “front plates” of the electric strike). In addition, the electrified mechanism in the Viro products is placed exactly at the centre of the striker, which is therefore known as a “symmetrical” installation. This not only makes it easy to adapt it to right or left-hand doors, but it is not even necessary, whatever the application, to vary the size of the recess made on the door jamb which houses the striker. 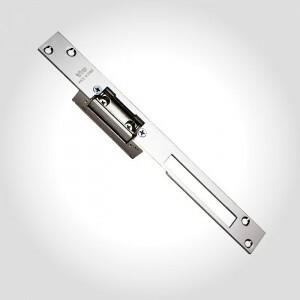 A Viro reversible symmetrical striker, suitable for right and left-hand doors, for pulling or pushing. 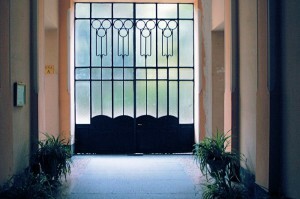 On some types of doors, such as wooden ones with anti-noise seals, or if the position of the lock does not allow it, it is not possible to use reversible strikers with straight front plates. In this case, it is necessary to use a corner striker, which rests on the corner of the door jamb. 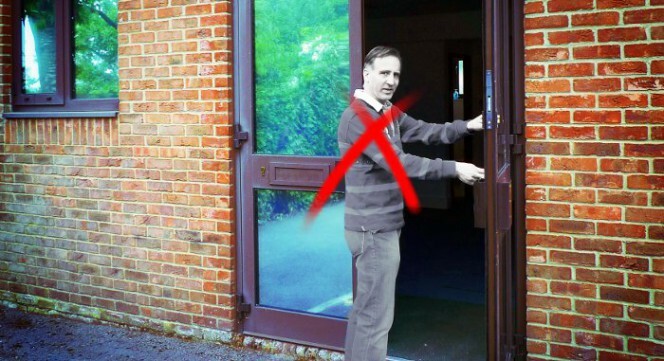 Of course, with corner strikers the versions for right-hand doors differ from those for left-hand doors. The corner strikers are different for right and left-hand doors. Both in the case of a new installation and for work on an existing lock, the finish of the front plate of the striker must match that of the lock, e.g. brass-plated, nickel-plated or stainless steel. 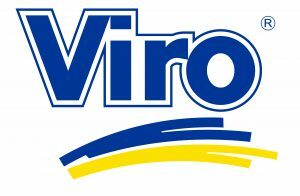 For this reason Viro fronts plates are available in different finishes. 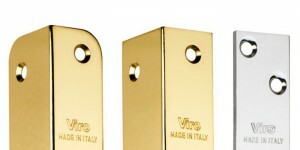 Viro electric strikers are available in various colours and finishes to match the lock plate. But an electric strike is able to do much more than simply remote opening. In particular, there are 3 very interesting advanced features, and we will look at them in detail in a future blog. Come back and read more! This entry was posted in electric strike and tagged strike on 19 May 2014 by Mara Rossi.